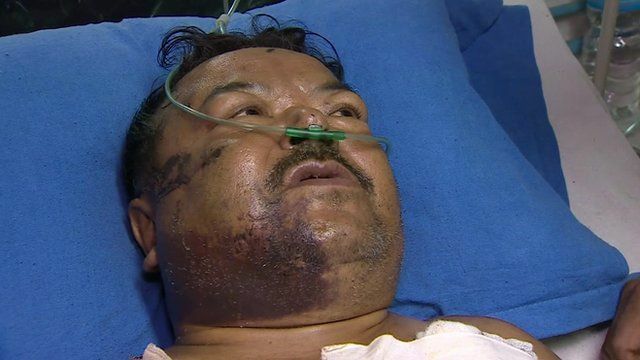 Quake survivor pulled from apartment Jump to media player A man pulled from the rubble of a Kathmandu building talks about his ordeal. Yogita Limaye reports from Kathmandu. On the ground in quake-hit village Jump to media player The BBC's Adrienne Murray is one of the few journalists to reach Gorkha - the district of Nepal where the earthquake struck. Fleeing Kathmandu: It's fearful here Jump to media player BBC News hears from people leaving from Kathmandu bus station following the devastating earthquake in Nepal. Volunteer: We're trying to find bodies Jump to media player A volunteer tells Yalda Hakim how he has been looking for bodies, alive or dead, in the rubble in Kathmandu, following the devastating earthquake in Nepal. 'We were thrown from wall to wall' Jump to media player Borders journalist David Knox tells BBC Radio Scotland's Angela Soave how he and his family survived Nepal's massive earthquake. Nepal earthquake 'like disaster movie' Jump to media player A cameraman from south Wales has said the aftermath of the earthquake in Nepal was like something out of a disaster movie. In Nepal emergency aid is beginning to reach the remote communities worst hit by the weekend's devastating earthquake. Meanwhile search and rescue efforts are continuing. The government has admitted that it is struggling to cope with the disaster. Clive Myrie reports from the capital Kathmandu.